SALISBURY, Md. – The Wicomico County Sheriff’s Office is investigating a “strong armed robbery” that happened on Friday, across the street from Parkside High School on Beaglin Park Drive. 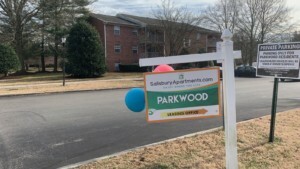 According to officials, the incident happened at an apartment complex across from Parkside, around 2 p.m. The suspect has not been caught. It’s not immediately clear what the suspect stole or who he/she might be. However, officials say that a “strong armed robbery” means a weapon was not displayed, but aggressive force was used. Just before 2 o’clock, Parkside High’s Facebook account posted a status saying, “Parkside school families: Due to an incident in the community near Parkside, our school is currently on a precautionary safe in place status. We will update families as needed in a call later today. 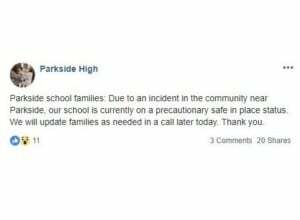 Thank you.” However, 47 ABC saw students leaving the school around 2:30 p.m.
We will update this story as we receive more information.